Space Shuttle Endeavour will have it's final mission this week from the launch pad of the Kennedy Space Center in Cape Canaveral, Florida. The crew of this mission are: Mission Specialists Mike Fincke, Greg Chamitoff and Andrew Feustel, commander Mark Kelly, pilot Greg H. Johnson, and European Space Agency astronaut Roberto Vittori. The Endeavours mission is to install the cosmic particle detector on to the International Space Station. Endeavours first mission was on May 7, 1992 called Maiden Flight: to capture and redeploy Intel Sat VI and that was 2 decades ago. Endeavours current mission is significant because it will be its last mission and will soon retire at the California Science Center in LA. Endeavour travelled 103.1 million miles; orbits 4,429 in total and the name Endeavour was inspired by the two ships of exploration by James Cook. It's total time in space is 280 days with 24 total flights and with 148 total crew members for 20 years. Installing the Magnetic Spectrometer will help study the Universe and its origin by searching for dark matters. It is designed to operate as an external experiment on the International Space Station. Supposedly, April 29, 2011 is the launch schedule but, due to technical problems on the heaters auxiliary power unit, NASA announced a 48 hr delay of the launch. The expected crowd in Cape Canaveral is 750K thus, Florida is beaming with the positive luck right now. Business in the Sunshine state is pretty awesome. It was only after Easter that I learned that there was a Station of the Cross last Friday in Lake Eola,located in downtown Orlando. There were 600 Catholics who participated in the event led by Bishop John Noonan from the Diocese of Orlando. On that day, my husband and I went to a place in Kissimmee (Disney Area) and since we are nearby this church, I told my hubby that we should pay a visit. The moment I walked inside, I had the feeling that this will be my home church. I always wanted to belong here. As I sat down on the last pew, I saw a Filipino family ready to leave the church and came to me and said, "I know you". I hesitated a moment thinking who she was. Then, she introduced herself and she was my childhood neighbor. For more than 20 years, we never seen each other. What's the possibility of seeing a long lost friend at a precise moment in a specific area of a huge city in another country? The probability is a miracle right? I call it a blessing! I can't help myself but talk about it over and over again. Anyway, I had my quite moment inside the church with my hubby and we both love this place. Even though I miss the church activities that I had in the Philippines (just like what's on the clippings here), my Good Friday in the US turned alright. Source of the picture clippings here came from Google images about Good Friday in the Philippines. I appreciate the guest post, Jamie Guy. In Naples, Florida, there are plenty of great restaurants to choose from. As a place for major tourism, Naples has no shortage of great restaurants. This makes the competition quite stiff for great restaurants. One of my favorite places to eat at in Naples is Gumbo Limbo. Gumbo Limbo is located right on the beach and offers some of the most fabulous views of the ocean. If one wants to take a great vacation and enjoy inexpensive food on the beach, then Gumbo Limbo is the place to go. With bamboo floors and a fun tiki bar, Gumbo Limbo is simply the best place to relax and take a load off. I loved the burger and fries I had at Gumbo Limbo. The average plate of food costs about ten dollars, which is not too bad considering that one is right on ! the ocean. If one wants to enjoy some great food, then Gumbo Limbo is definitely the place to visit in town. Surprisingly, it is part of the Ritz Carlton hotel located in Naples. One would expect the food to be expensive, given its partnership with the Ritz, however it is still quite affordable. Overall, I love this restaurant as a top pick in Naples, Florida. I think some good advice to remember is to set a home security alarm from securitychoice.com before leaving one's home, because you might not return after visiting this place! I basically grow up with my mother's big influence on Catholic Religion. The church is her only refuge to have that peace of mind from all the misery of life. She was a single parent with two kids and I can't even imagine how she was able to hurdle her life "alone" without the support of anyone but HIM, the creator of all things! The best years of my life was waking up at dawn time to be in the Cathedral for Easter! I can still smell the fresh air of dawn as we waited for that procession. As far as I can remember, we never missed this special Catholic event every year! When my mother lost her job (I was 10 years old), we need to find another place to live and the first thing on her wish list was move to another community with a chapel nearby. And we did! The chapel is a walking distance from our home in fact, you can hear the on-going mass from our home. She became an active parishioner in the church, I became a member of the choir and my other sibling became an altar boy or we call it: Sacristan. I remember one Holy Thursday, my mother had a big news. She was excited that she was chosen to participate during the Washing of the Feet. Every church activity, we were active and it's all because of my mother. During Holy Week, I was always appointed to become a reader for Station of the Cross and I miss those moment. Living here in the US, away from my immediate family and friends made me feel so empty. My faith never ceased and thanks to my mother for having me know Jesus, the risen Christ and redeemer of the World. This is a Sponsored post written by me on behalf of FRESCHETTA®. All opinions are 100% mine. Today, hubby and I decided to have FRESCHETTA® By the Slice Pizza for lunch. We used the oven and cooked it for 18 minutes and we enjoyed every bite of it. There are four flavors of Freschetta by the Slice Pizza: BBQ Recipe Chicken, Vegetable Medley, Six Cheese Medley and my most favorite Chicken, Spinach and Mushroom. Since we already tried two of it's varieties, this time we bought BBQ Recipe Chicken for me and Vegetable Medley for Hubby. It was so good that we clean our plates real good. The BBQ flavor is sweet with a kick of spicy in it and the toppings are so delicious! My husband enjoyed his vegetable medley because he can taste the freshness of the vegetables in it. The Pizza by the slice of Freschetta is the right portion that we can eat. No more "save for later" pizza slices because Freschetta by the Slice is a good size that can fill up a hungry stomach. For more information about this product, please follow @FreschettaPizza on Twitter or check out http://www.facebook.com/freschettapizza on Facebook and click the LIKE button. You can also join to win a FREE Freschetta Pizza for a year! How's that sound? Visit the Facebook page now, LIKE and join the fun for a chance to win FREE Pizzas. Have a delicious Pizza Party everyone! HGTV and DIY are two of my most favorite channels. The picture below is Ahmed Hassan from Yard Crashers of DIY channel. Whenever I got the chance, I watched his show. He is a licensed landscape contractor and specialized in residential design. His 20 years experience in landscaping and home improvement business made him the most sought-after young landscape designers in the Bay area. 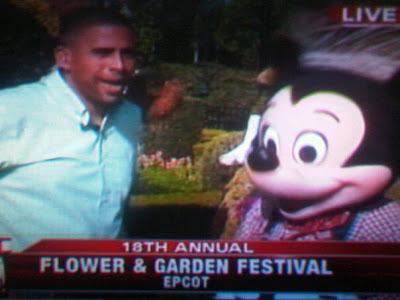 He was one of the celebrities invited to grace a show on the ongoing Flower and Garden Festival in Disney Worlds Epcot Theme Park. This year marked the 18th Annual Celebration and visiting Epcot during this season is fantastic! Ahmed Hassan is the guy who frequent in Lowe's or Home Depot looking for that lucky buyer! He will approached the customer with the camera around asking if they are willing to bring him home and show him what needs to be done in their backyard. Most of the people would say NO to him! They don't recognize him and of course, they don't trust him! A person who needed extra help badly would say YES to his approach. What in store with them is mind-blowing! Ahmed Hassan will totally design, their backyard for FREE! It is like winning a lotto jackpot once you say YES to Ahmed Hassan! If you see him in your area, say a BIG YES! Total transformation of your backyard awaits! I am so sleepy right now but, I can't wait to tell you what I was up to today. I was supposed to file our taxes but, hubby and I need to do some errands so, I will be doing it on the last filing day! 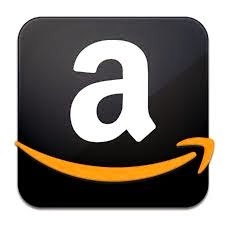 We also bought this software which is hubby's advance birthday present. 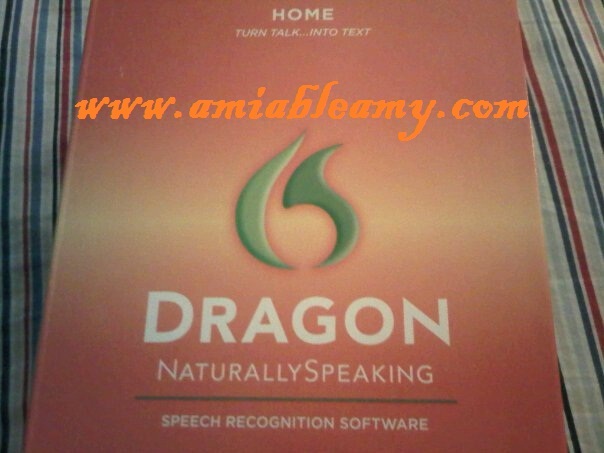 This software is called Dragon Naturally Speaking 11 Home is really cool because it provides a whole new way to interact with a PC. It will use speech instead of a keyboard and mouse. After installing it, my husband say the words and the words appear on the computer screen. Honestly, it's 10x faster than typing, with no typos at all! My husband is enjoying it because he can tell his PC what to do and it obeys his commands such as: mic off! Dragon Naturally Speaking understands what he says and how he say it. Awesome right? So, try it yourselves! I highly recommend this product! I wanted to have a sports activity and the easiest one to get into as part of my fitness plan is biking. I do not need expensive mountain bike so I got this design instead. Today, hubby bought the Ladies' Huffy Savannah Road Bike, with a Deep Red steel hybrid frame, and has the right geometry for a good fit. It has the suspension fork which provides a smooth ride over bumps. I love the color that got, it's a deep red and the design is awesome. The front and rear linear pull brakes, both are made of alloy. It has a suspension seat post, a comfortable padded saddle and a convenient rear rack for errands purposes. I do not need it though. 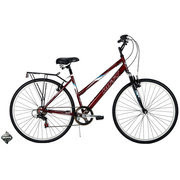 Huffy Ladies' Savannah Road Bike has adjustable top with load 2-bolt handlebar stem for riding support. It also has an 18-speed Shimano Revo twist shifters provide easy shifting. I plan to ride my bike inside the condo vicinity only. We need to sweat out for good health right? 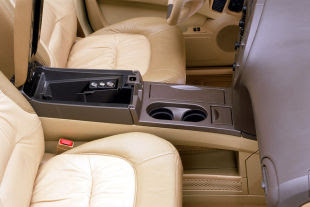 In 2002, the Rendezvous is Buick’s brand-new model. 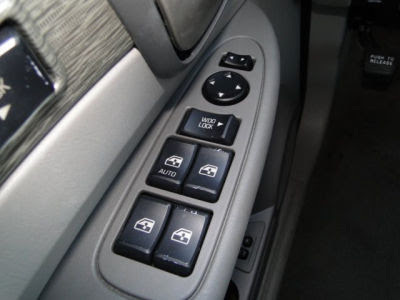 It is a crossover vehicle, a combination of the comfort of a sedan, a sport utility vehicle and a minivan, blended in one. It is the first truck-based Buick since 1923. 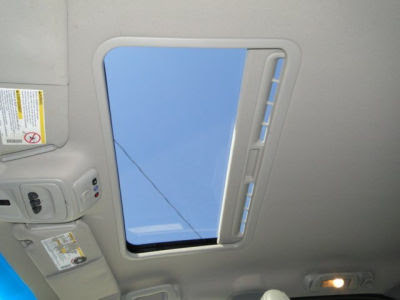 Just showing the sunroof feature of the car. The Rendezvous has teal illuminated needles and numbers set in a silver face accented by chrome trim rings. It was meant to evoke the luxurious look and feel of an expensive SUV. 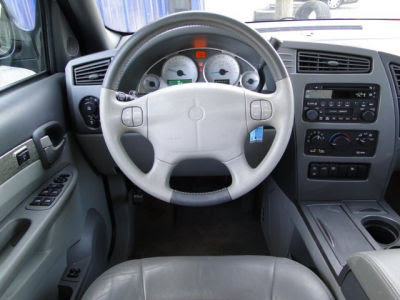 The make of this model type was 2001-2007. It was Tiger Woods who did the commercial for Buick Rendezvous during the Buick Classic Golf. 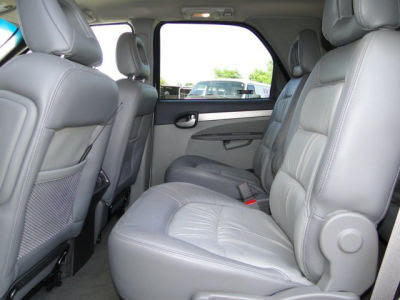 This mid-size crossover SUV features a large cargo capacity, seating for up to seven 7 people. It is a luxury automobile and it rides smoothly. It is a sport utility vehicle because of it's truck styling design and available all wheel drive Buick hopes to attract more younger buyers and counteract the brand’s appeal to older motorists. Buick exhibited the Rendezvous at golf tournaments, the COMDEX computer dealers’ convention and various public events. 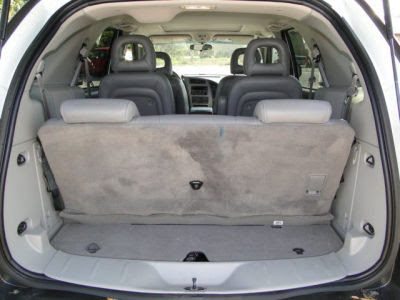 The Buick Rendezvous is good for cargo carrying capacity; has elevated seating height with active outdoor lifestyle. 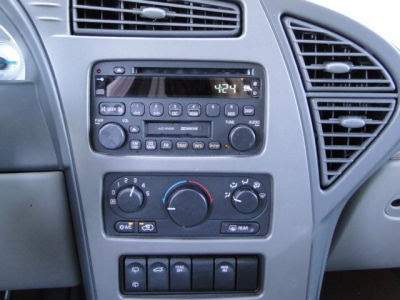 We purchase the Buick Rendezvous today because it has low mileage and great in gas. 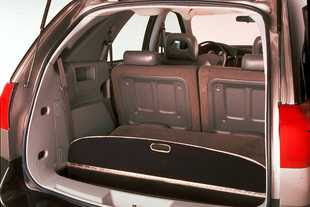 This is a great alternate car for us because it has lots of room. 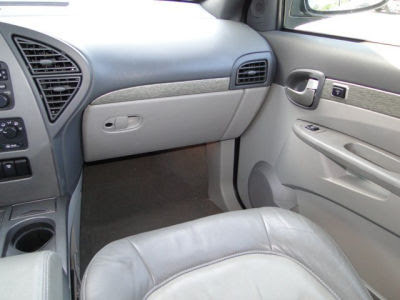 This RENDEZVOUS CX MODEL is automatic with leather interior and has a power sunroof. It has an alloy wheels, rear bucket seating, 3rd row seating with rear power lift gate. It also has Dusk Sensing Headlights, Coil Front Spring and a regular front stabilizer bar, It also includes automatic door locking and unlocking, a tire-inflation monitor that illuminates if low tire pressure is detected, an ultrasonic intrusion-alert system that can detect movement inside the vehicle while it’s locked, an optional Ultrasonic Rear-Park Assist system that uses ultrasonic sensors. I hope that this baby will provide a good service for both of us.